Ujima | Aaron of The Hungry Hutch discuss how he teaches people to feed themselves without expensive ingredients, such as his richly flavored Braised Pork Neck and Cabbage Recipe. By John Burton Jr of The Food Cravelogist Always one to fiddle around with new flavors and cuisines, I stumbled upon a mouth-watering cabbage recipe in a book entitled The African Kitchen. Looking for a food writer, ingredient or recipe? Search here. The word "Kwanzaa" comes from the phrase, "matunda ya kwanza" which means "first-fruits." Kwanzaa's extra "a" evolved as a result of a particular history of the Organization Us. It was clone as an expression of African values in order to inspire the creativity of our children. In the early days of Us, there were seven children who each wanted to represent a letter of Kwanzaa. 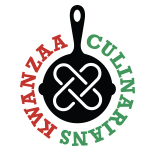 Since kwanza (first) has only six letters, we added an extra "a" to make it seven, thus creating "Kwanzaa." To learn more about Kwanzaa, visit the Official Kwanzaa Website.